As someone who travels frequently and often picks up a few too many things during their trips, a foldable travel duffel bag has become a necessity. I really wish I had purchased one sooner. There have been too many times where I’ve been stressed about fitting all my travel souvenirs and gifts into my luggage. An extra duffle bag that you can pop open to use at any time solves this problem and avoids excessive baggage fees. 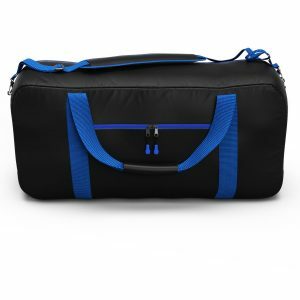 This style of duffle bag is also great for the gym, carrying groceries, weekend trips and pretty much any time you need a bag. By foldable we mean that these duffle bags can conveniently fold into a small zippered pouch that you can pack into one of your larger suitcases or bags and bring it out whenever you need it. To narrow our choices for the best foldable duffle bags, at the minimum we required them to be lightweight, durable, pack small, and be tear and water resistant. What size bag should I get? The very first thing you need to take into consideration is how big do you need your bag to be? We have grouped our best foldable bag picks into three groups based on sizing – 40-50 liters, 50-60 liters, and 80-90 liters. If you want a bag to take onto a flight, the maximum dimensions for a carry-on bag are 9 x 14 x 22 inches (22 x 35 x 56 cm). To fit within these dimensions a bag will roughly be 40-50 liters. Anything more than this and the bag will be too big as a carry-on and be more suitable for other activities. 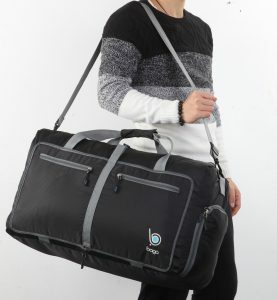 One of our top picks for travelling is the Wandf Foldable Travel Duffel Bag. The reason why we liked this bag is because it fits perfectly within the dimensions for a carry-on, is lightweight, durable and has lots of room inside. 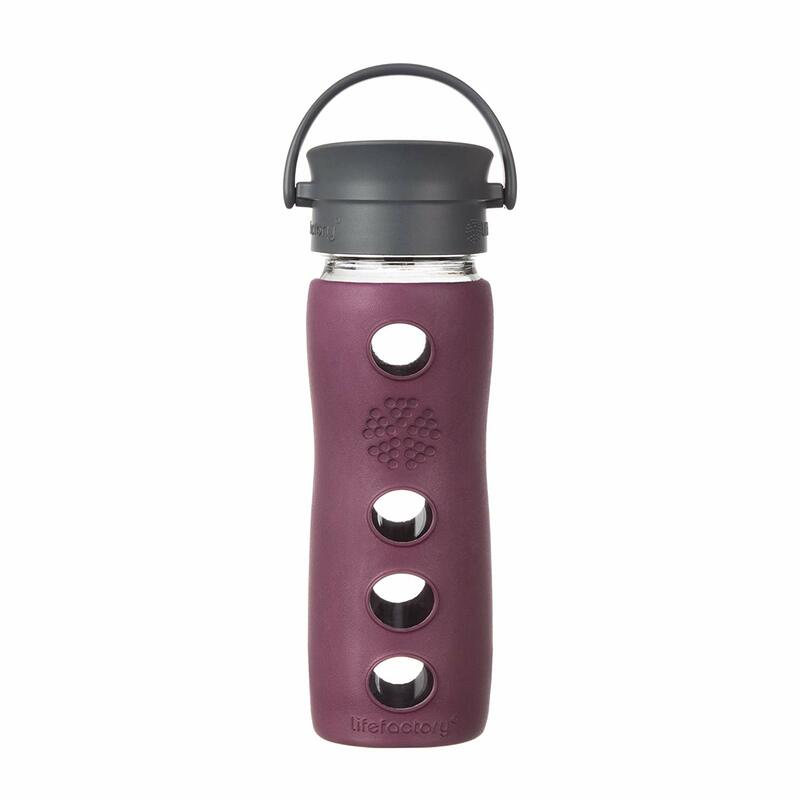 It has one primary large compartment and a single front gusseted, storage pocket. This bag also is an excellent size — not too big and not too small. We liked that it was taller and less wide than other comparable bags, making it easier to stack and sort things when you don’t have enough stuff to fill the entire bag. The handles are also tough and strong and it comes with an adjustable shoulder strap, although it doesn’t have a comfort grip to make it easier to hold for long durations. The bottom also does not have any grip or special material to keep it from getting dirty. However for the price, this bag offers incredible value and versatility. 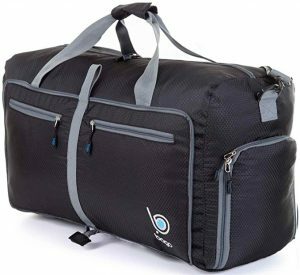 If you want to save a few dollars we suggest going with the 40 liter Travel Inspira Foldable Travel Luggage Duffle Bag. There is only one large compartment and a small side pocket for organization. 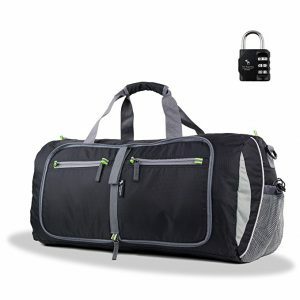 This is a more traditional, longer style duffle bag that is good if you need a bag in a hurry. The inside is quite big but the material feels a bit flimsy and thin. It is still durable but we don’t recommend putting too many heavy things inside of it. Otherwise it is a great, cheap travel duffle. It is okay as a carry-on or a sports bag but it would probably rip if you used it as a luggage bag. 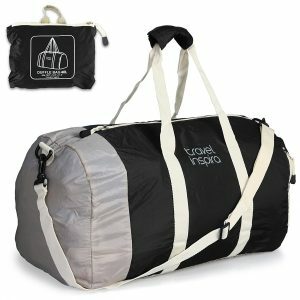 At 48 liters the Friendly Swede Foldable Travel Duffle is slightly bigger but at a similar price range. This is a very functional duffle bag that is lightweight, tough and folds very flat and compact about the size of a folded shirt. It has two zippered side pockets and a two mesh pockets on the front and back for carrying things like water bottles. Overall the material and zippers feel high quality and sturdy with lots of areas to store anything you need. The shoulder strap is also padded if you need to carry the bag for extended periods. It also comes with a small combination lock and a lifetime warranty. This is a great choice for a foldable bag, especially for the gym. Of the 40-50 liter bags, this is the most expensive but also the toughest and highest quality. We are referring to the 40 liter BAGSMART Foldable Travel Duffle. While it is a little bit heavier than other foldable bags, this is because it has a thicker, more durable 280D nylon material that will withstand the elements better. In total it has a double zipper main compartment, one front zippered pocket and two side zippered pockets. The back also has straps that you can use to attach to the handle of wheeled luggage. This is a true, high quality multi-pocketed duffle bag that will last you a long time. It folds up easily by essentially pressing the two sides together. 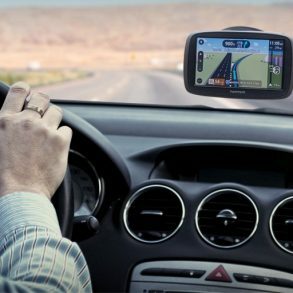 Great for the gym, travel and anything in between. The medium sized Bago Travel Duffel Bag sits at 1.3 pounds and holds 53 liters. This bag offers great versatility and durability and is handy if you need a second piece of luggage. It has honeycomb ripstop fabric and high quality corded zippers. There are two zippered pockets, a shoe pocket that can also be used for dirty laundry, two handle straps and a removable shoulder strap. The inside is big and roomy and you’ll be able to fill more than you thought. It also comes in a larger 85 liter version. 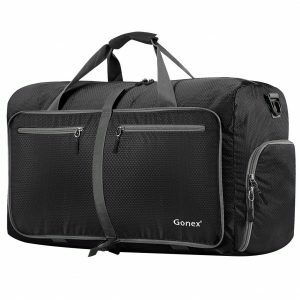 The Gonex 60L Foldable Travel Duffel is another fantastic bag that is very similar to the Bago in terms of design. It is slightly bigger at 60 liters but offers the same two front zippered pockets, shoe pocket, handle straps and removable shoulder strap. It also has a zippered pocket on the inside. This is an overall excellent, high quality bag that you’ll be happy with. 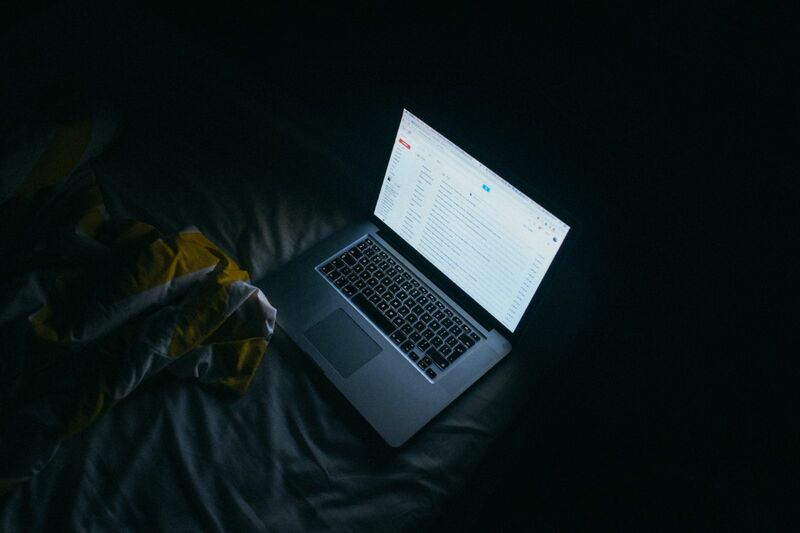 It folds to about the size of a piece of paper at about an inch thick. Of the three bags in the 50-60 liter size range, the Travel Inspira Foldable Travel Luggage Duffle Bag is the cheapest of them. However is still offers great value for price if you need a simple duffle bag without the extra zippered pockets or shoe pocket. It only has one zippered pocket near the bottom right that is useful for smaller objects. 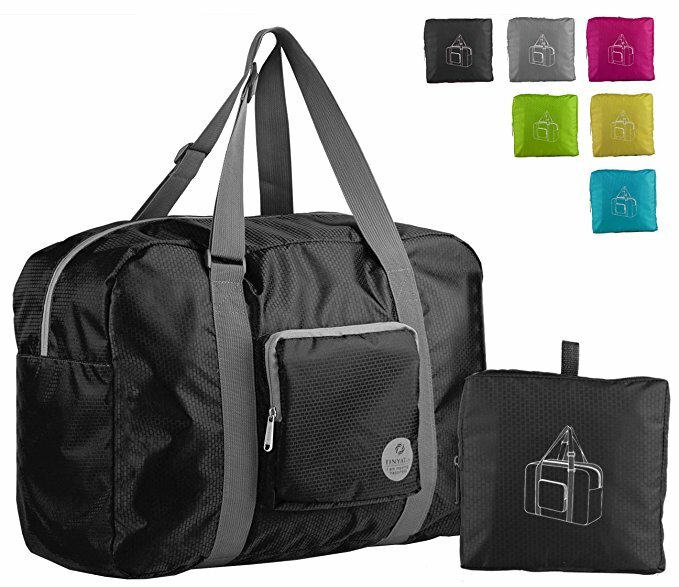 This is a great duffle bag if you need a simple foldable bag with lots of space and don’t need too many extra pockets. It also takes up very little room when folded up. It is fairly durable and the zippers are strong but just be aware it won’t withstand heavy abuse or sharp objects. Extra large duffle bags (over 80 liters) are the way to go if you need to haul around lots of stuff regularly. 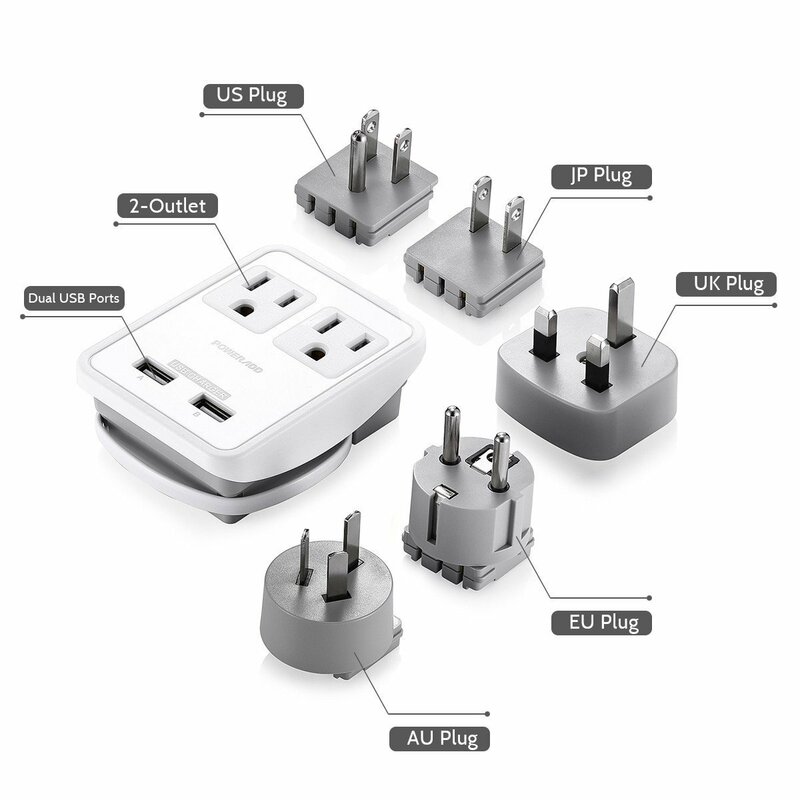 They are also good as a secondary piece of luggage when travelling. As with the other sizes, we have three recommendations depending on the material, design and number of pockets you want. 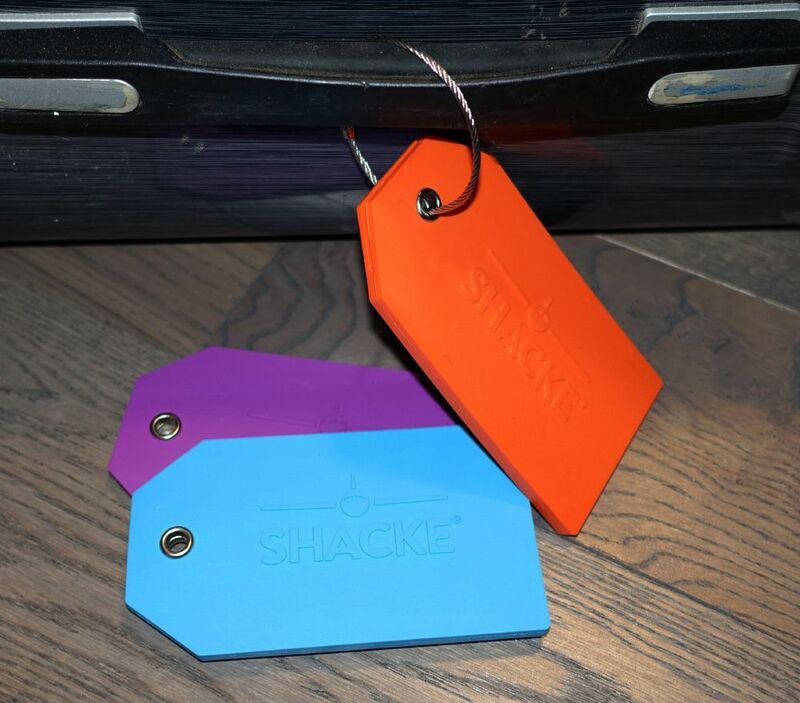 The Shacke Duffel XL Travel Duffle Bag is a little different from the other lightweight duffle bags. The material used in this bag is a thick nylon with a double bottom lining. This allows it to carry over 70 pounds of weight and is more durable compared to the ripstop nylon used in other bags. While it is about double the weight (1.3 pounds) of similarly sized foldable duffle bags, this is the bag you’ll have the greatest peace of mind with and is the most comfortable to carry. 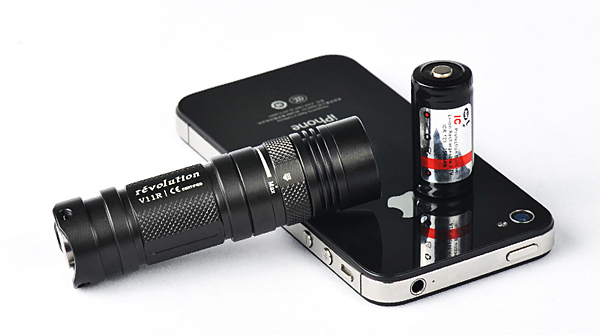 The thick nylon makes it much less susceptible to ripping and tearing and much tougher for everyday heavy usage. In terms of pockets, there is a single large zippered pocket on the front and one on the interior. The main large compartment and the outside pocket also have double YKK zippers to let you hook on a TSA lock. The handles are comfortable and the shoulder strap also has memory foam allowing for easy carrying for long periods of time, especially with the heavier weights this bag can hold. Of the three bags listed here, this one is our favorite because it is huge, highly durable and thick, and very comfortable to carry. Yes the material is heavier but this bag is designed to be carrying large amounts of weight. This is the bag you’ll want as extra luggage that you won’t be worrying about being thrown around. On top of that, this bag offers a lifetime guarantee against defects although we doubt you’ll have to ever use it. One the most reliable bags is the 85 liter Bago Travel Duffel Bag pictured above. Like the smaller version, this one has honeycomb ripstop fabric that is highly durable and tear resistant. The bag is lightweight and folds small and has two zippered front pockets and a side shoe pocket. 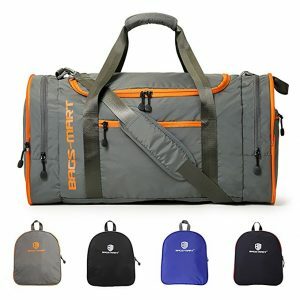 Its great for long and short trips and can be used as luggage or for the gym. 85 liters gives you a lot of room to work with and you should have no problem fitting everything in. You can even used the adjustable shoulder strap to wrap around the bag to keep it snug. Overall this is an excellent all-purpose bag that will last. As with the smaller versions, the 80L Gonex Foldable Travel Duffel Bag is similar to the Bago in almost every way. It has the same honeycomb ripstop fabric, two side zippers and shoe pocket. It is only slightly smaller at 80 liters compared to the Bago at 85 liters. An excellent, inexpensive, tough bag that folds small and has lots of room. Great quality all-around for a lightweight bag.